Mister Freedom® MAC Jacket, cotton back sateen OG-107, mfsc “Surplus” FW 2017, made in Japan. Mister Freedom® MAC Jacket, cotton-back sateen OG-107. 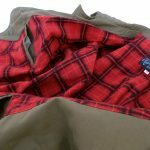 Following the recent release of the stellar Apollo ’69 Sukajan, the sultry indigo jungle cloth Jungle Riders and M-17 Parka, and the higge-ly Nixon shirts in red and blue printed corduroy plaid, the anticipated final installment of our Fall 2017 MF® “SURPLUS” line-up is the versatile MAC Jacket. 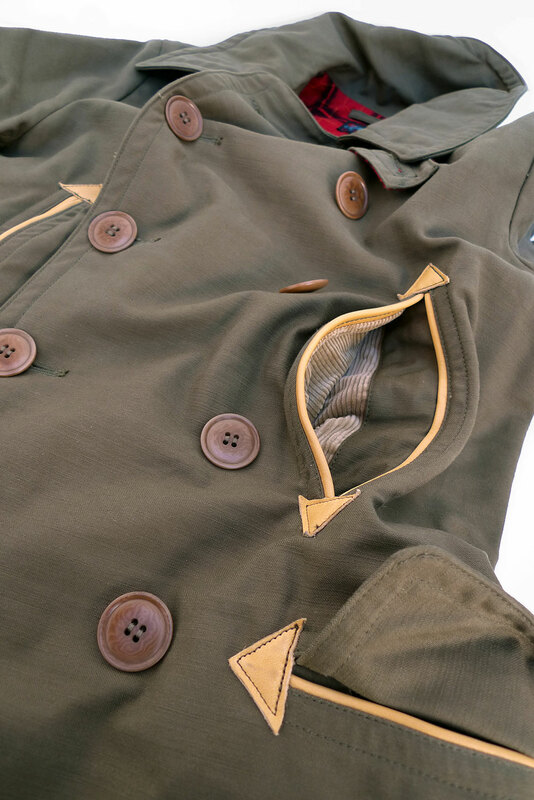 Design-wise, we simply stripped the US Navy Peacoat early pattern from most of its maritime lineage, save for the two small anchor buttons concealed under the collar to keep the throat latch in place. We basically turned the iconic nautical garment into a lightweight, casual and classic-looking jacket with an outdoor vibe. Those familiar with the MF® catalog will notice that we have already given many skins to the P-jacket through the years. 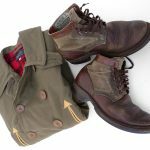 We wanted a totally new garment this time, blending the vibes of seafaring jackets, Mackinaw coats, US Army M1938 jeep crew coats, vintage casual and old-school utilitarian garments. The shell fabric we opted for is an old favorite, a US military vintage mil-specs cotton-back sateen cloth, shade Olive Green #107. Access to this special fabric is courtesy of our friend Mr. Kameha, expert Quartermaster at Buzz Rickson’s, the illustrious military uniform-related branch of Toyo Enterprises. 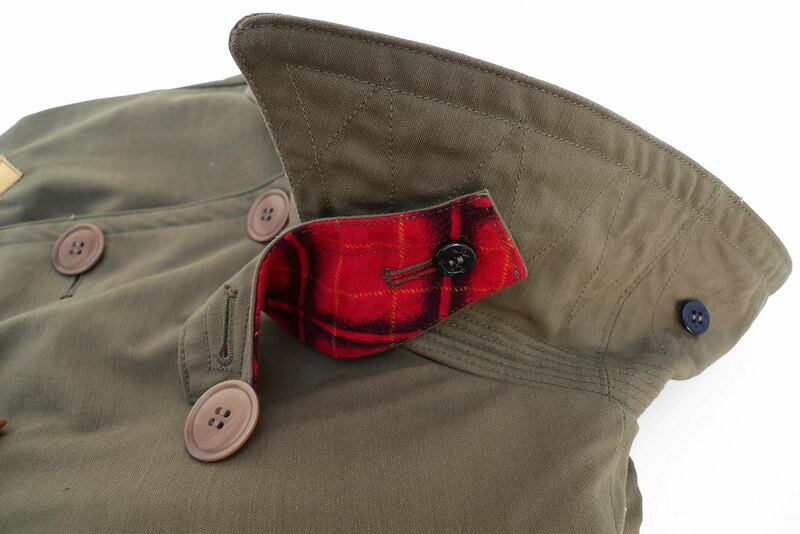 We have previously featured this fabric, both on the FW 2014 OG 107 Down Vest and an iteration of the Sportsman Chinos. 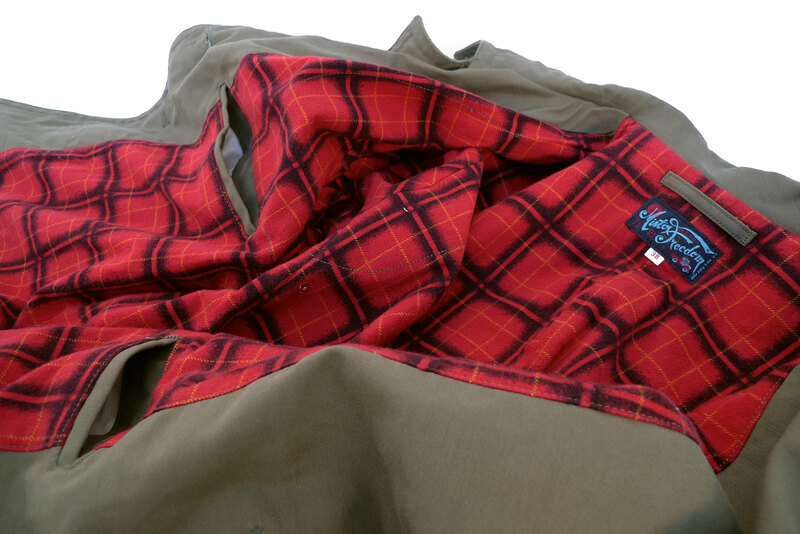 For the lining, we opted for a soft-hand printed cotton flannel (same vibrant fabric we cut our 2013 Camp Flannel Shirt from), contributing in giving the MAC jacket its outdoorsy 1950’s flair. 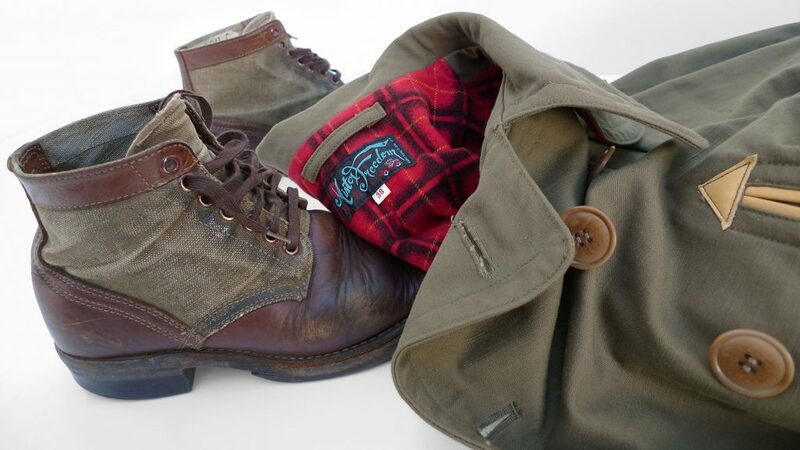 The inspiration for combining the olive green sateen with natural-color leather pocket accents (arrow-head pocket stops and piping) came from an old pair of vintage US Army cold-weather mittens featuring a similar OD poplin shell/leather facing combo. 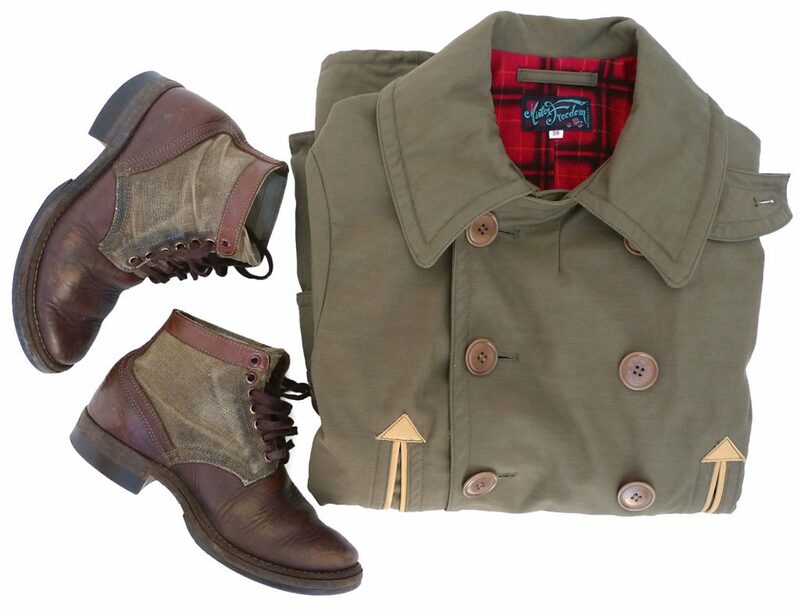 Overtime, the leather acquires an attractive patina, complimenting the olive green fabric. 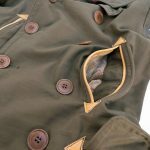 The traditional double pocketing of the lining has been updated for the 21st Century by adjusting the size of the “cigarette pocket” to fit the average smart phone, rather than a pack of Lucky Strike. 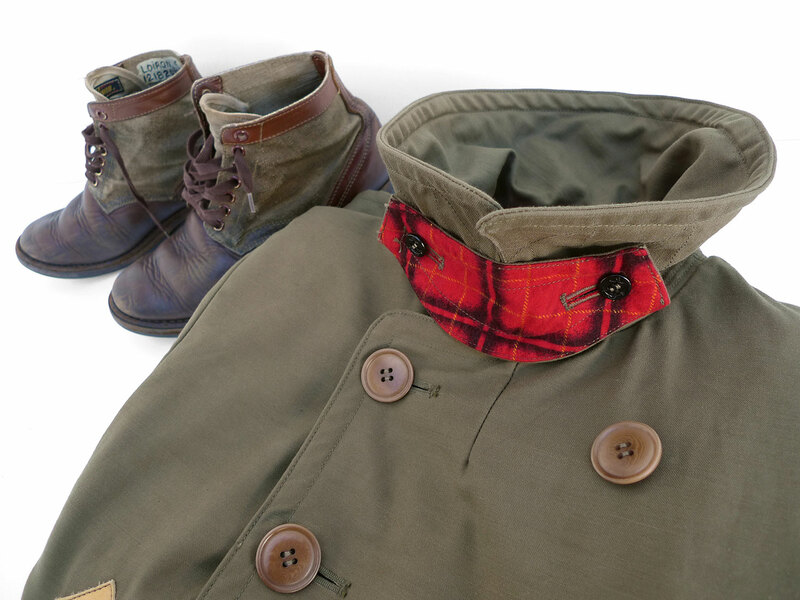 The Mac Jacket is designed in California by Mister Freedom® and manufactured in Japan by Sugar Cane Co. Shell: Mil-specs 9 Oz. cloth, 4/1 (four warp up, one weft down) cotton-back sateen, Olive Green #107 shade (grayish-green, Pantone Color approx reference would be 450 U), milled in Japan. Lining: 100% cotton brushed flannel, discharge-printed with a vintage-inspired plaid pattern. Milled and printed in Japan. 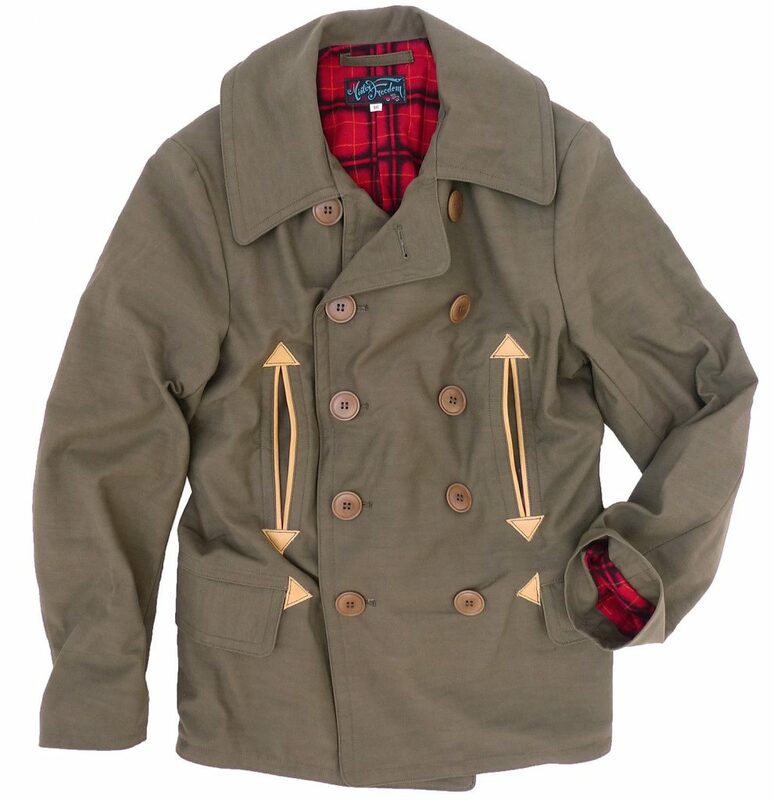 * Pattern based on the early US Navy 10-button melton wool Pea-Jacket. * Brown corozo wood buttons. * Four outside pockets, two ‘hand warmer’ slash pockets and two flap closure pockets. All lined with golden brown cotton-wool blend corduroy. * Inside chest pocket and traditional ‘cigarette’ pocket (converted into an iPhone6-size pocket). 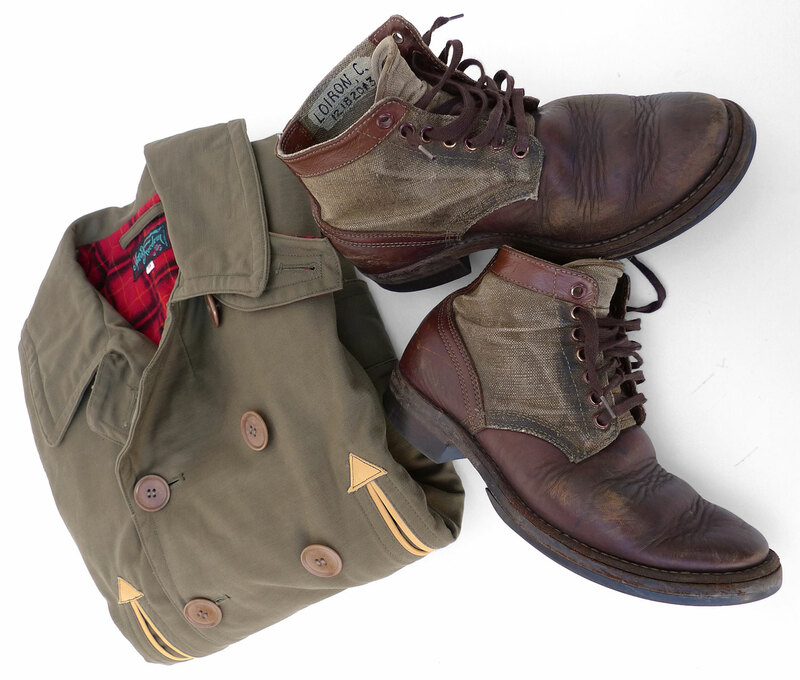 * Natural-color leather piping and arrowhead reinforcement on pocket edges. * 1950’s-style plaid print soft-hand 100% cotton flannel body lining. * Traditional Zig-Zag pattern under-collar reinforcement stitching. 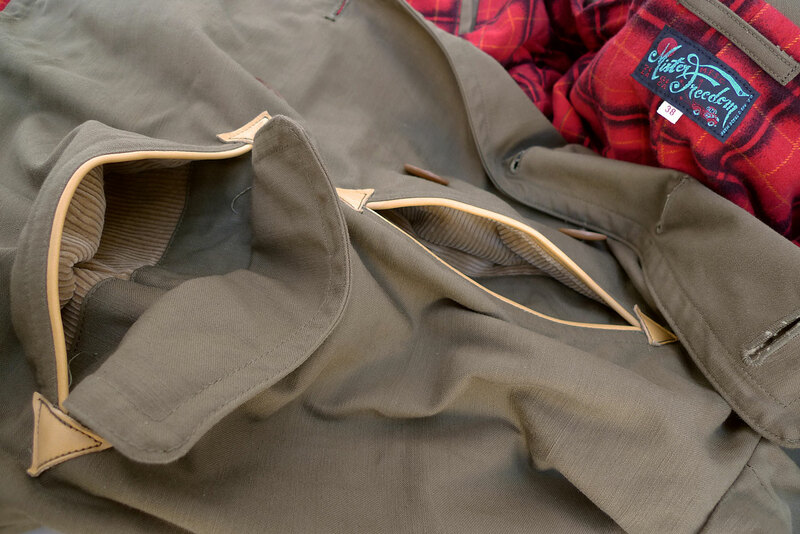 The Mister Freedom® Mac Jacket comes raw/unwashed. We recommend an initial cold soak/rinse and line dry. 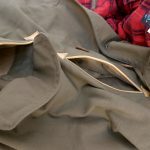 The jacket will shrink to tagged size. This garment is true-to-size. 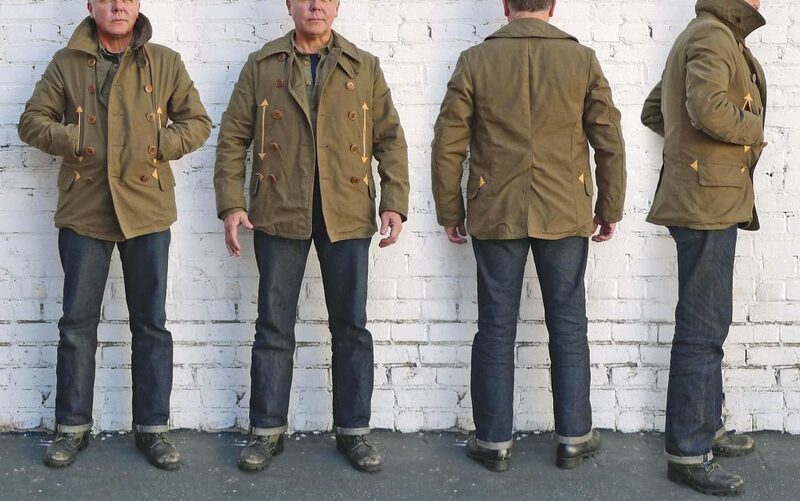 I tend to wear a 38 (Medium) in mfsc jackets, and opted for a slim-fitting 38 in the Mac jacket. The fit is quite snug (wearing a Skivvy T and a Garrison Shirt on the fit pix), so if you are in-between sizes, go for the size up. Please note that the lining will shrink slightly more than the shell, and will tend to ‘pull’ after the garment is rinsed/dried. 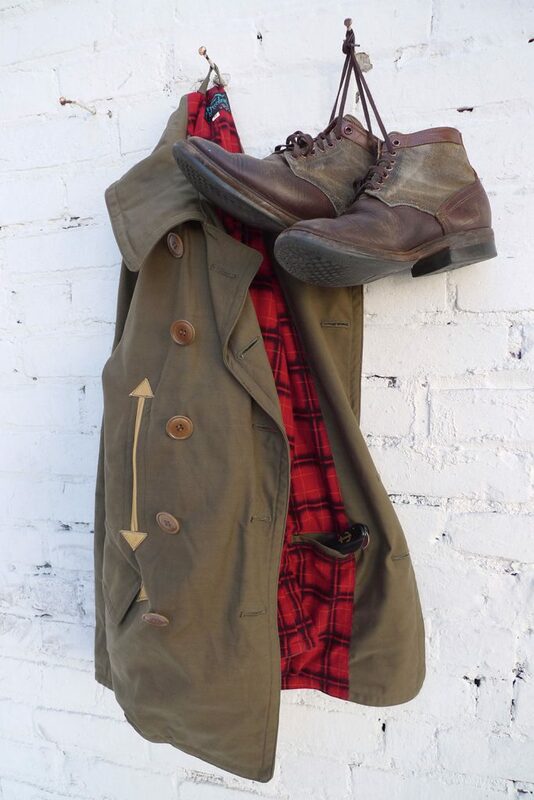 This is intentional, and a typical (and quite desirable effect) of vintage clothing. We recommend professional dry-cleaning, in your local eco-friendly facility. However, this garment can be hand-washed or laundered on DELICATE, cold water, minimal detergent. 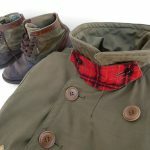 Due to the bulkiness and weight of the garment when wet, make sure the capacity of your equipment is adequate before attempting a machine wash at home. Hang dry.